was established on December 18, 1832, from former Creek Indian homelands and a portion of Pike County. 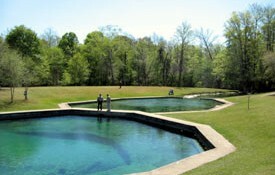 Blue Springs State Park is located about 6 miles east of Clio, Alabama in southeast Alabama, 2595 Hwy 10, Cilo 36017. You can obtain information regarding the park calling 334-397-4875; faxing 334-397-4875 or by email to: BlueSprings.STPK@dcnr.Alabama.gov. Barbour County is a county Alabama. As of the 2010 census, the population was 27,457. Its county seat is Clayton Alabama. Its name is in honor of James Barbour, who served as Governor of Virginia. On March 24th, 1837, the last significant Indian battle in Alabama was fought between 900 warriors of the Creek Nation and white settlers. Led by General William Wellborn, a large force of volunteers and militia left Eufaula, Alabama (then called Irwinton) to find and capture or kill the Creek Indians who had fled into the swamps following an attack on the camp where they were being held prior to their removal to present-day Oklahoma. Reaching Hobdy’s Bridge, then a long wooden span and causeway, Wellborn learned that the main party of Creeks were camped about one mile north of the bridge. Sending part of his force up the east or Barbour County side of the Pea River under Captain Harrell, he moved up the west or Pike County side with his primary command. As he neared the site of the camp, gunfire erupted in the swamp. Wellborn defeated the refugee Creeks but had failed to surround and capture them. They fled south down the Pea River to its confluence with the Choctawhatchee and continued across the line into Florida. Several hundred men, women and children fled into the Pea River swamps and began and desperate attempt to make their way to Florida. Outraged over the attacks, they were determined to fight their way through if that’s what it took.